If you read between the lines of every non-job description you can see even more of your money going up in smoke. After getting over the initial shock that we – me, you, the taxpayers down the street – are paying for this non-job, you read on to find that considerable resources have not only gone into this job, but also the ‘strategy’ behind the job. Yes, that’s right, for every non-job, someone’s sat at a desk devising a strategy for it. I don’t know what’s worse, wasting money or devising strategies to waste even more taxpayers money. But yet it still continues in local government and, even more depressingly, local NHS Trusts. There you have it taxpayers’ money, £37,000+, going to pay for someone to stop you falling over (a glorified banana peel collector?) 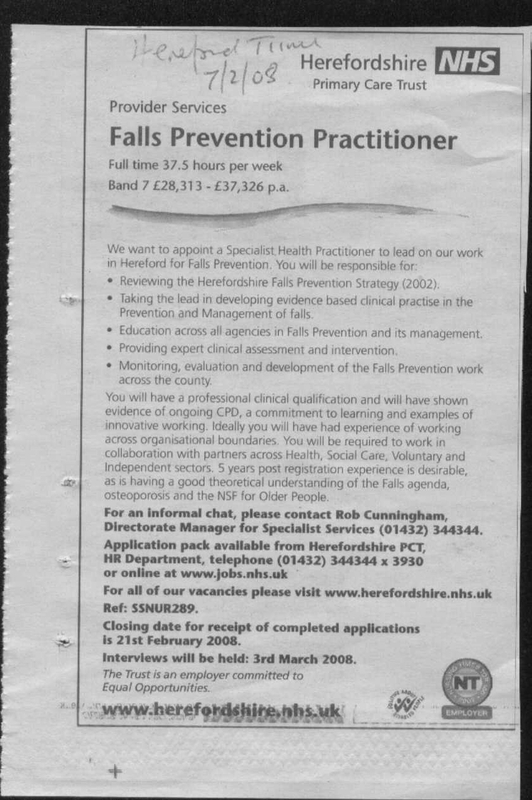 but there’s someone in the Herefordshire PCT who has devised a ‘Falls Prevention Strategy’. There are times like these where nothing else needs to be said except that if you’re riled, angry and frustrated that the government are routinely wasting your money – do something about it. Join our campaign for free here, register as an activist and tell people about the TaxPayers’ Alliance. Alternatively, donate to our campaign here. This is your campaign to stop the taxman getting his hands on your money, so we’re counting on you to do your bit!